Kevin Durant's probably waiting for the second half. 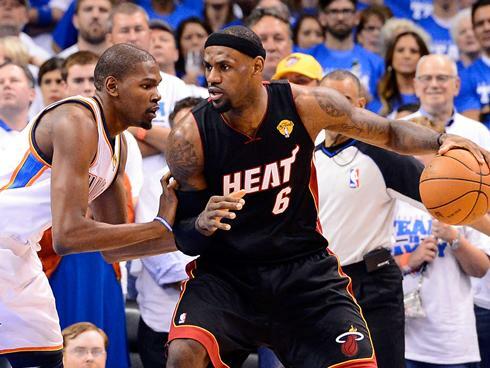 The Oklahoma City Thunder star had two points and two fouls in the first quarter as the Miami Heat took a 27-15 lead. But he scored 17 points in the fourth quarter of Game 1, a Thunder comeback win. LeBron James, who beat Durant for NBA MVP, racked up eight points on 4-for-8 shooting in the quarter. He operated within the context of the team's offense and barely seemed to break a sweat. The one fault: James' dunk attempt was blocked by Serge Ibaka, the NBA's top shot blocker, at the end of the quarter. The small forwards guarded each other early, but the Heat continually mixed up coverage on Durant, as they did in Game 1. They also found an effective matchup with forward Shane Battier on point guard Russell Westbrook as they raced to a 21-6 lead before Durant left with his second foul. We'll keep you updated on how James and Durant perform all night here.